Sharp has unveiled two new full-HD LCD touchscreen monitors and the newest version of its gigantic multi-user tablet at the ISE (Integrated Systems Europe) 2014 event in Amsterdam. The new monitors include the 20-inch LL-P202V model, which comes with a digitizer pen, and the 24-inch LL-S242A, which features a highly-sensitive touch panel. The LL-P202V is a thin and lightweight display designed for image design work or general office productivity, thanks to the included digitizer pen. Line thickness can be altered by applying varying amounts of pressure. Two function buttons allow programming of common actions like use of the eraser. It comes with an ergonomic stand that allows the display to be tilted from 20 to 75 degrees. The LL-S242A is designed for interactive display or digital signage, with Sharp Digital Signage Software included. A pen is also provided, and palm cancellation technology means that users can lean upon the screen with their hands without interfering with what they are writing or drawing. Both models are scheduled for a European launch in May. The new Big Pad Advanced Model, which is on display at ISE, comes with a number of new features, such as simultaneous writing by up to four people, pressure sensor pens, remote data sharing with Touch Display Link Software 2.0, faster bootup time, a new touch menu, and improved connectivity. 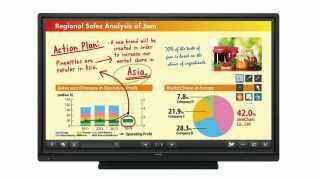 The multi-user tablet can be employed as an educational aid, a presentation tool, or as as an interactive workspace, thanks to it essentially being a digital whiteboard. The Big Pad Advanced Model will launch in Europe in April. No pricing has been confirmed for any of the newly announced products. Is digital signage the way of the future?